Liisa (rear, center) with classmates and professor in the Careers in Teaching course. The professor was a Japanese man in his 50s or 60s, and he had those quintessentially Japanese features that made him look stern and kind at the same time. I probably looked like a scared mouse – I had never had to speak Japanese to a professor before. Eventually the teacher began talking, explaining the syllabus and giving insights on the first topic of discussion – the meaning of being a teacher. I hung on to every word, but still grasped just a fraction of what he was saying – his speech was littered with words I’d never heard, which made most sentences uninterpretable. It was as if somebody had bleeped most of the words he was saying, and I had to guess his meaning from the tenth of his speech that was audible to me. But I didn’t mind – I was in a classroom filled with future colleagues, listening to a lecture in Japanese with a breeze way too warm for August blowing into the room, accompanied by the loud but beautiful singing of unfamiliar bugs. It was surreal, picturesque, and quite literally everything I had hoped for when I applied to AIU over other Japanese universities. Plus, I didn’t have to embarrass myself speaking Japanese anymore. Oh man. Surely not the dumb foreigner? By the end of the class, I had managed a self-introduction, a writing assignment, and a group discussion. My performance was far from impressive, but I left feeling happy. Despite my linguistic deficiencies, I was never left out of anything. Week after week, I kept coming back to that warm classroom, even though I felt guilty for making my teacher and classmates sometimes explain things in English just for my sake. It seemed entitled. I stopped sitting in the back. Several lectures, group discussions, reaction papers, and one field trip later, I could participate in the class without several hours of preparation. Neither my teacher nor my classmates had any obligation to help me – they could’ve left me in the back. But instead of ignoring me they encouraged me, challenged me, and helped me to grow as a person. It turns out all you need to overcome a huge challenge is hard work and the support of a caring, accepting, cosmopolitan community like AIU. So, what’s your challenge going to be? 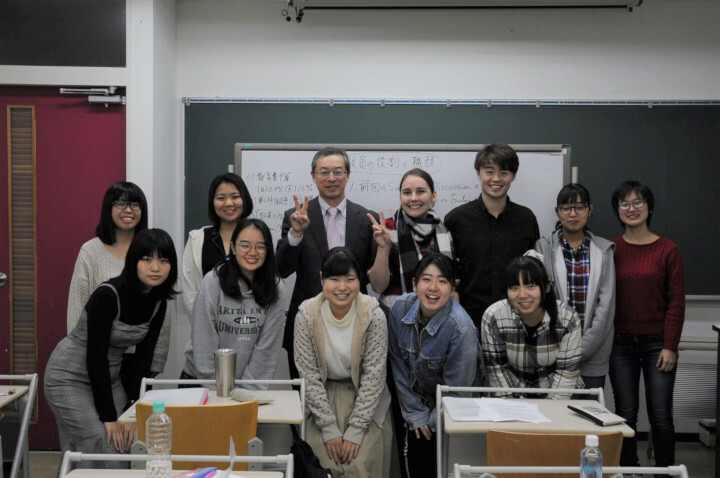 1The Teacher's License Program is a series of courses outside the curriculum designed to prepare students to take the Japanese government's exam to become a licensed teacher. All curricular courses at AIU are taught in English.